Applies only to dogs and cats over four months of age. Owned dogs & cats: In addition to state-mandatory rabies vaccination, owned dogs and cats must be spayed/neutered & microchipped. Community cats: In addition to the state-mandatory rabies vaccination, outside cats, both owned and unowned, must be spayed or neutered. No microchip required for community cats with the Trap-Neuter-Return (TNR) left ear tip, performed during spay/neuter surgery. Breeders: Breeder pets, in addition to the state-mandatory rabies vaccination, must be microchipped, and must also have a veterinarian-issued Health Statement issued at least once every two years that must include the pet's microchip number. Each puppy or kitten in a litter must be microchipped by four months of age and have a vet-issued Health Statement prior to sale or transfer. Breeder must have this information available upon request by law enforcement or animal control. It is the new owner’s responsibility to obtain these documents from their Breeder during the sale or transfer of the animal. Medical: A veterinarian can exempt a non-breeding pet for medical / health reasons. This exemption must be documented on the pet's medical record. Pet owner must have this information available upon request by law enforcement or animal control. Residents of the City of Waco may qualify for FREE spay/neuter for owned dogs and cats based on income, location/zip code, and available funding. FACT: There are FREE and low-cost options to getting your animal spay/neutered and microchipped. A fine for non-compliance could cost you over $500 if your animal gets impounded at the Animal Shelter. Spay/neuter surgery could cost as little as $60 (depending on your qualifications and where you get the surgery performed). When a pet gets a new owner, it is the previous owner’s responsibility to make sure that new owner updates the pet’s microchip owner contact information. 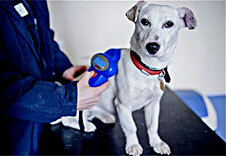 This can be done by contacting the microchip company (i.e., HomeAgain, 24PetWatch, Avid, ResQ, etc). Residents may have their pet microchipped at their pet’s full-service veterinarian. Low-cost microchip providers in McLennan County: Humane Society of Central Texas ($20) and Animal Birth Control Clinic ($25). McLennan Area Rescue Coalition (MARC) hosts free microchip clinics approximately once a month. The City of Waco will partner with other organizations to provide free microchip clinics in areas of Waco. Follow SpayStreet Waco on Facebook for upcoming dates! SpayStreet Waco is a volunteer effort with members of the community in partnership with Animal Control and the Animal Shelter to spread the word about the Spay/Neuter and Microchip law that went into effect January 1, 2014. 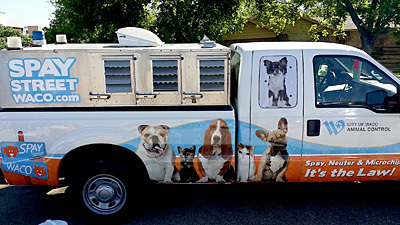 Numerous outreach efforts are planned to focus on areas of Waco help and educate citizens on free and low-cost options available to them to have their pets spay/neutered and microchipped to keep their pets in compliance with the law. This volunteer effort also addresses strays in our community and helps in getting them spayed and/or neutered and adopted out to good homes. It is a fact that by spay/neutering your pet, they live healthier lives, are less likely to roam and keeps our animal shelter population down. SpayStreet Waco’s success depends on the community and its volunteers! Contact us through the SpayStreet Waco Hotline at (254) 752-7729 and choose option 1; contact Ashley Durham at (254) 749-4190; contact us through Facebook, or email us here! Television: I Am Responsible! -- Spay is the Way! Radio: Spay is the Way! See the entire Municipal Code of Ordinances relating to animals in the City of Waco here.